Growing up, we all would have played with toys. The right toy at the right time helps engage the babies and contributes towards their development. Not just that, it also provides parents with peace of mind. 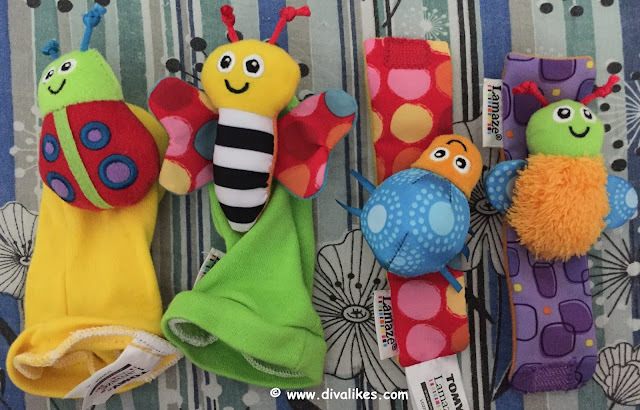 Considering the same, Lamaze Infant Development System has come up with a comprehensive system of soft toys based on Lamaze International's philosophy of healthy parenting. 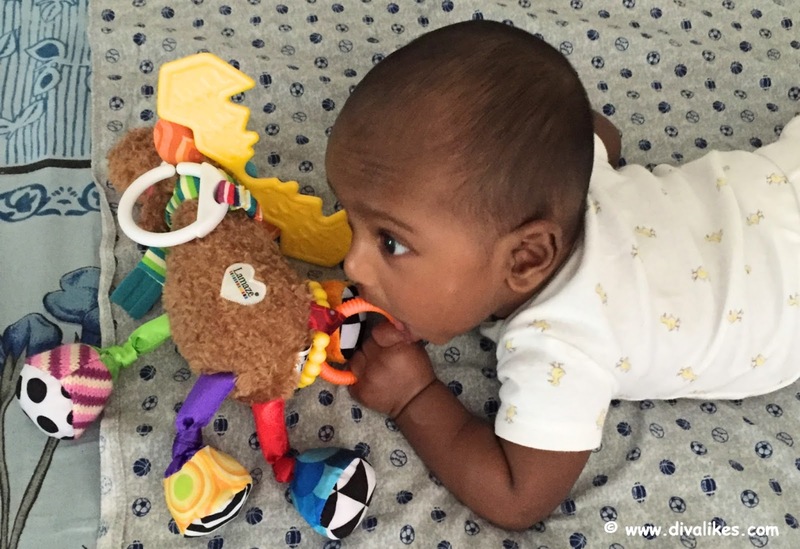 Being first-time parents, we were confused about the choice of toys for our 5-month-old boy Aakarsh. 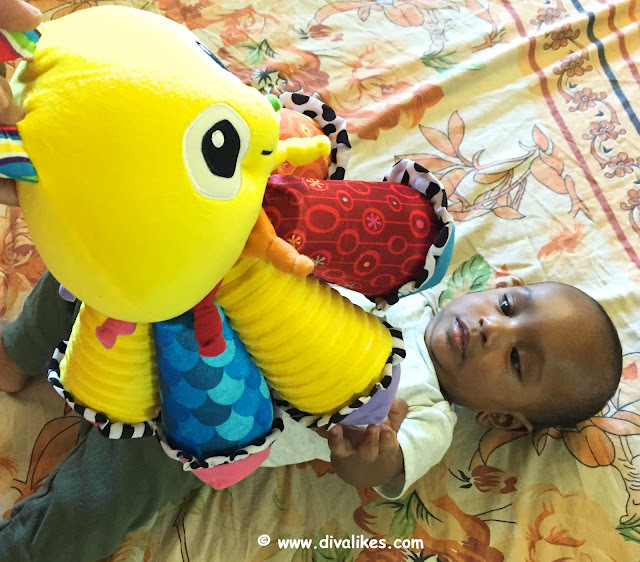 When the Lamaze toys came home and our baby boy started playing with them, it was a path of fun, healthy play and learning. 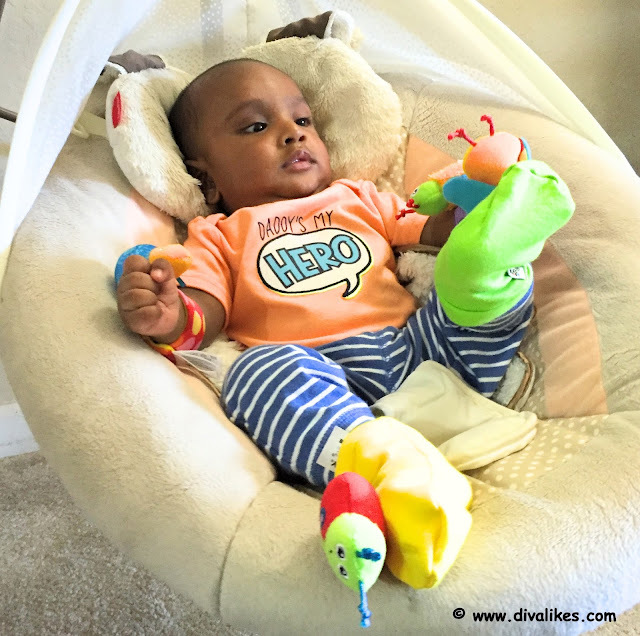 Here are the wonderful 3 products our boy totally loves! Let me start with Aakarsh's favorite toy. It is Garedenbug Foot Finder & Wrist Rattle Set. It has enchanting rattle sounds which encourage baby to reach and grab. This promotes sensory exploration through sight, touch, and sound. Aakarsh loves his time in the swing. It is where he plays with his legs and hands. Off late, he started holding the teethers too. Now with Lamaze Gardenbug Foot Finder & Wrist Rattle Set, he is super busy reaching the gardenbug, makes movements to create sound and grabs it. He gets too involved in his play time with the gardenbug and we love watching him! Mortimer the Moose has some bright colors and multiple textures for the baby to explore. 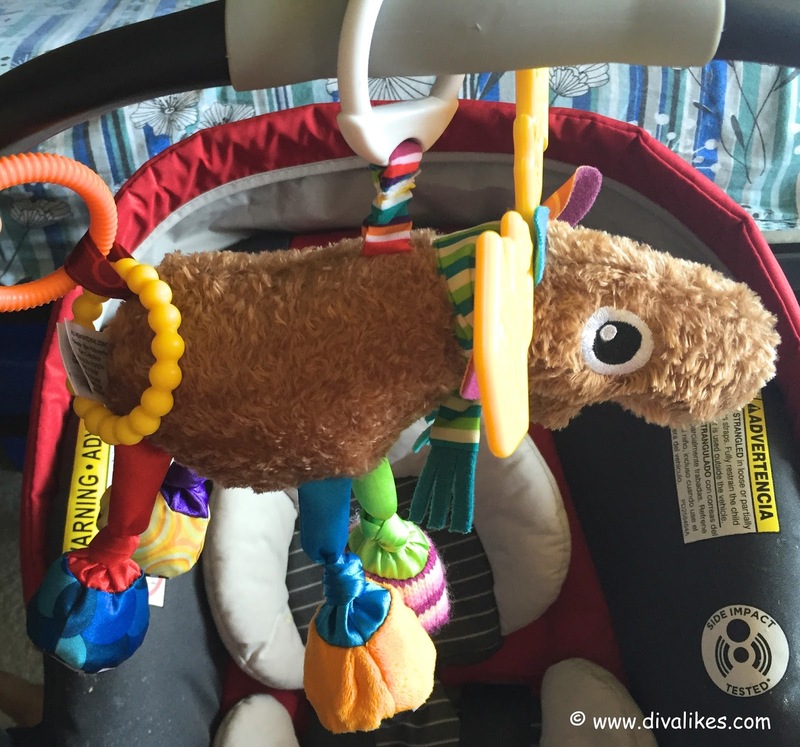 It has teethable antlers, squeaker body, and knottie activity legs. This toy has sufficient things for the baby to explore and develop. Now the time has come where everything Aakarsh gets a hold of, goes into his mouth. Mortimer the Moose happens to be one of his favorites. When placed near him, he observes it for a while and decides what he should hold. He loves playing with it. To calm him during our road trips, we put it in his car seat and then he is one happy baby playing with it. 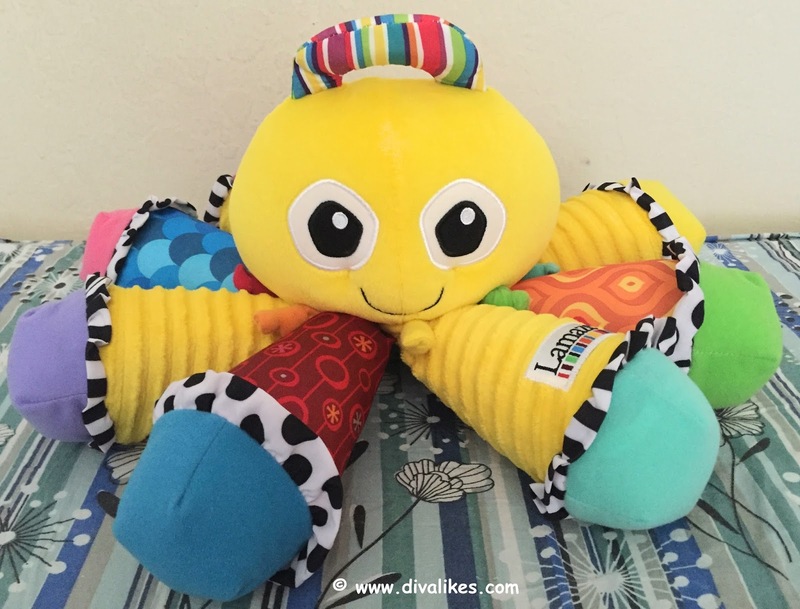 Eight floppy legs, large friendly eyes, eight tentacles each of which plays a different note when squeezed - all these come together as a package in Lamaze Octotunes. There is a note with instructions for each song which you can play. All we got to do is follow the color-coded notes that correspond to the colors on Octotunes arms. When Aakarsh first saw Octotunes, he brightened up seeing the attractive eyes and color of the object. He loves playing with the legs by holding and pulling them. He is too small to squeeze the legs himself to get a tune but we do it all the time for him! "Mary Had A Little Lamb" and "Twinkle Twinkle Little Star" tunes are always on the play by either mommy or daddy for our little bundle of joy. This toy is definitely fun and imaginative play for my boy. It does awaken his auditory senses and does a great job keeping him busy! All the three Lamaze toys have helped our baby to grow and develop through playing. Not just his play time but also together-time between us parents and the baby. Most importantly, all the Lamaze items meet or exceed industry and consumer safety regulations to ensure complete safety for your child. Now that you know what makes Lamaze toys special, go ahead and choose the products that are developmentally appropriate and most enjoyable for your baby. Lamaze products are now available at buybuyBABY. Let the baby explore and learn on his/her own with Lamaze toys! Disclosure: The samples were received from TOMY for review purpose. All opinions stated are my own.